A playful pup in Scotland has some serious talent for soccer, and he's eager to showcase it for one particular person — in fact, he insists on it. 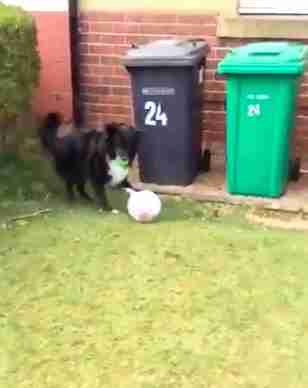 Amy Barbour, the daughter of a postman, tweeted this week that the dog has "mad skills" — and a video to prove it. "So this dug doesn’t let ma dad deliver the mail until he’s played football with him," Barbour wrote. "He finally took a video and a canny believe my eyes, the dugs incredible!" 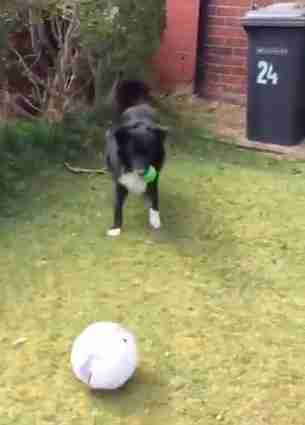 The footage that her father shot shows that the dog (even multitasking — with one smaller ball in his mouth) manages to kick the ball back and forth several times with the postman, who can't stop laughing during their playing. "That's brilliant," the postman can be heard saying. "That's incredible!" The dog is not only adorable — he's clearly a natural. Still, the match did seem to be a bit unfair: When you have four legs, there's no risk of a handball.